Despite talk in Europe of reducing dependence on Russian fuel and promises of help from the U.S., for the foreseeable future Russia remains the only country that can supply the EU with an increasing supply of cheap gas. The European Commission in Brussels is again discussing the issue of the supply of Russian gas – its reliability, the contractual basis, and ways to reduce dependence on it. At the same time, the U.S. is exhorting Europe to give up Russian fuel. Canada has announced its intentions to export liquefied nitrogen gas (LNG) as a replacement. Meanwhile, Ukraine is talking about reversing gas from Slovakia. In fact, there is not a single economic factor behind these discussions, which are essentially political proclamations. Moreover, Russia remains the only country, unlike other suppliers, capable of supplying Europe with ever more gas. Experts interviewed by Rossiyskaya Gazeta agree that European consumers will not be able to give up Russian gas, no matter how much they would like to. A reversal of supply along the four gas lines supplying Russian fuel to Slovakia would violate the terms of the contracts with Gazprom, Reuters reports, citing a representative of the Slovakian pipeline operator Eustream. “To reverse the flow, it is necessary to stop the flow from east to west in one of the mains, but permission from Gazprom is needed to do that. Gazprom does not agree with that, so this option is not being considered,” said a source from the agency. Sergei Pravosudov, CEO of the National Energy Institute, notes that if the fantastical scenario of giving up Russian gas were to occur, it would only be in the event of a development such as the world figuring out how to produce cheap energy by thermonuclear fusion on an industrial scale. Experts propose analyzing the future prospects for the European gas market by looking at the volumes of fuel currently being brought into Europe or those which might be imported in the near future. At the moment, gas flows in from five major suppliers. Russia occupies first place, followed by Norway, Algeria, the Netherlands, and Qatar. “Last year only two suppliers increased supply: Russia and the Netherlands,” Pravosudov points out. With this, exports of Russian gas attained record volumes of 161.5 billion cubic meters of gas in comparison with 2012 (138.8 billion cubic meters). The price also decreased by an average of 5.5 percent; the cost of 1000 cubic meters was $380. Regarding the Netherlands, it has already announced that it will reduce supply by 20 percent because it plans to use the expiring older fields to keep more gas inside the country. Norway does not promise a substantial increase either, and by 2020 it will begin to reduce expenditures on the search for new fields in order to increase extraction. In Algeria the internal demand for gas is growing. Moreover, this country, like Qatar, increasingly supplies LNG to China, Korea, and Japan; this gas sells for a higher price in the Asian markets. And there is practically nothing left for Europe. There is one more important issue, that of reception terminals for LNG in the EU. In Europe, discussions about the reception of LNG have already been taking place for about ten years. But the special terminals built, for example, in Spain, where they are needed least of all, are only being used to 20-30 percent of capacity and their owners are suffering losses. Meanwhile, Eastern Europe lacks infrastructure. 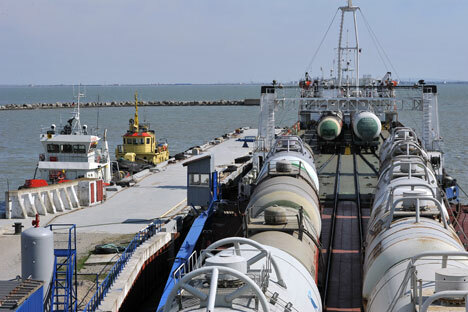 However, the biggest question, says Pravosudov, is whether America can, as it promises, supply the necessary volumes of liquefied nitrogen gas to the EU market, which it would have to increase production to do. The answer has already been established – no. In order to confirm this, analysts tried to understand how much money the U.S. invests in extraction, into drilling new wells. In 2013, drilling volumes were at their lowest for 15 years and had decreased by three times in comparison with 2008. The sharp drop in drilling as well as in the extraction of LNG is explained by the increase in the interest of Americans in the production of shale gas, and now even shale oil, the cost of which is $60-70 a barrel inside the U.S. And despite the fact that it is very difficult to extract it from rock at great depths, the U.S. is further ahead with extraction technology than any competitors. Meanwhile, the demand for LNG within the country on the part of motorists and energy suppliers is growing. Therefore no large-scale export of LNG from the U.S. will begin anytime soon. Moreover, experts emphasize that due to the decline in extraction and the rise in prices in the internal market, it will have to increase its free volumes from neighbor Canada. And the U.S. market will be a priority. In the opinion of Vladimir Feigin, the president of the Institute of Energy and Finance, Gazprom’s position in Europe is still impregnable. “There was a time when ‘road maps’ and charts were drawn up in the EU with terms for the potential reduction of the volumes of Russian gas by several percentage points each year through 2050,” says Feigin. “The calculation included the fact that a new generation of factories for the production of liquefied natural gas will appear in Australia, the eastern Mediterranean, and New Guinea, as well as the fact that part of the supply will go to the EU, competing with Russian fuel. “Firstly, this is not a rapid process. Secondly, the economic aspects have not been thoroughly calculated. On the whole it remains a strategic task,” says Feigin.